Conor McGregor set his sights on Featherweight Champion Jose Aldo after he dispatched Denis Siver within two rounds in a raucous night in Boston. In front of an avid attendance of 13, 828, the fighting Irish were out in numbers as McGregor emphatically made a claim for a title shot. Earlier, Donald Cerrone pipped Benson Henderson in a thrilling co-main event. Here is full recap of all the night's action, with recaps for fights from prelims to the main event. What a great way to kick off the card. This fight was action-packed and a war. Matsuda rocked Sanchez right off the bat with a couple of right hands and starting getting the better of the standup exchanges. All of a sudden.. BOOM! Sanchez lands a straight right and drops Matsuda to the canvas stealing him the round. Tateki came back in Round 2 and landed his right hand at will. In Round 3, The talented Sanchez took over and rocked Tateki with a combo dropping him to the canvas. That combo sealed the win for Sanchez! Congrats to Joby on his first UFC win. Van Buren lit Oconnell up with knees to the body and excellent knees in the clinch, and it was surprising to see Oconnell eat all of them. Van Buren has definitely improved his striking. The same happened in Round 2 but in striking exchanges Van Buren was leaving his chin straight up in the air and Oconnell finally lands a huge right hand that rocks Van Buren. Van Buren recovered enough to make it to Round 3, but still left his chin in the air. Oconnell kept the pressure on him and landed a left hook followed with a right that rocks Van Buren. Oconnell goes in for the kill and gets the stioppage. Fantastic fight and congrats to Oconnell on his first UFC win. 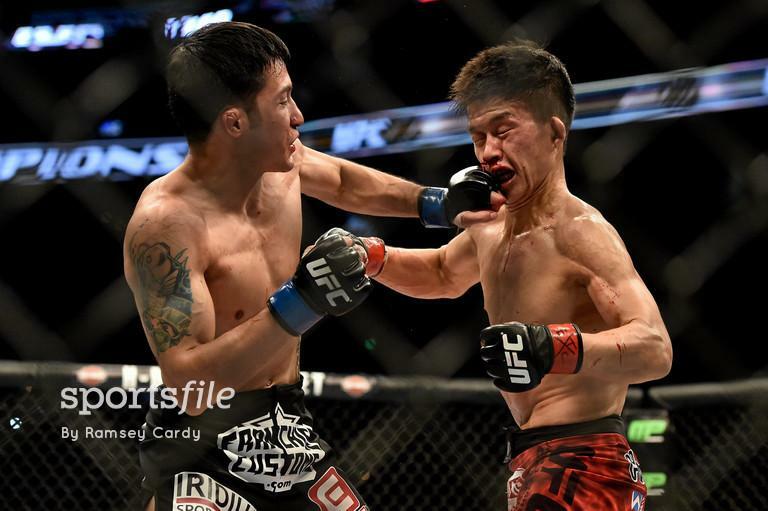 Soriano came out and showed his improved ground game when he was taken downand attempting a triangle from bottom. When on the feet Soriano lanes some nice leg kicks that hurt Soriano every time. They each had their moments in scrambles in Round 2, but Rosa was coming out on top by attempting nasty armbars. Soriano made the mistake in not keeping the fight on the feet. 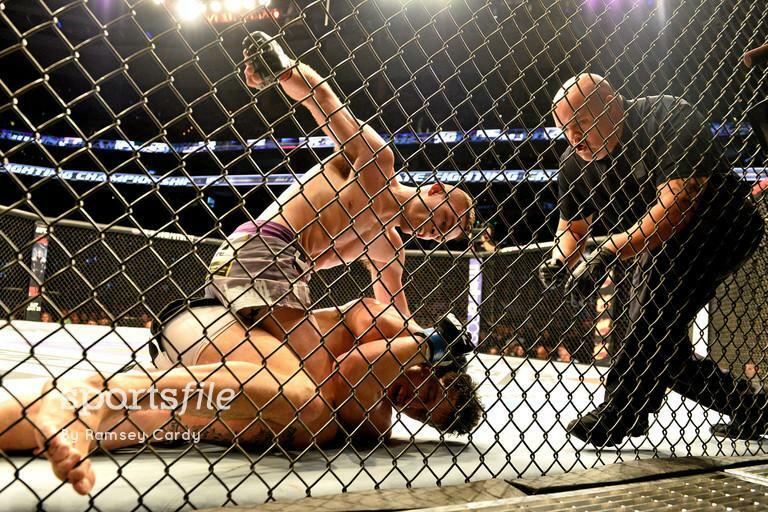 Rosa turned the pressure on and picked up his 1st UFC win via Darce choke. Case dominated this fight from bell to bell. Perez was no match for the prospect Case in this fight. Case wins by TKO in the 3rd round. Maybe a fight with Matt Wiman can tear Case's ability and see where Case is truly at in the 155 lb division. Hoolihan dominated from bell to bell. He spent the majority of the fight on Howell's back looking for a choke. Hoolihan is an interesting guy at 125 and did a nice job of recovering from a loss. He should fight either Louis Smolka or Ray Borg if he beats Chris Kelades. This fight was pretty uneventful, but Wade was able to edge the fight out. Wade is one of the best prospects at 155, but I am not sure if he is ready for big step up in competition. Maybe a fight with Vinc Pichel makes sense next for Wade. Larkin entered the 170 lb division in devasting fashion. He absolutely starched Howard! I see nothing but bright things for Larkin at 170. He could fight the winner of Patrick Cote/Joe Riggs or the winner of Koscheck/Ellenberger. The decision in this fight was highway robbery. Pendred got rocked and dropped in the 1st round and blasted with right hands in the 2nd round. The third was close but somehow two judges scored it 30-27 Pendred. Spencer clearly won this fight, and Pendred needs some serious work on his standup game. This fight was pretty uneventful. Tibau outpointed and out positioned Parke and stayed ahead on the scorecards. Tibau is just a hair off the top 15. Tibau could either fight the winner of Tony Feguson/Yancy Medieros or the winner of Al Iaquinta/Joe Lauzon. Stallings was doing fine until Hall landed a counter straight right busting up Stallings' face, and the fight was stopped. He called Costa Phillipou a punk after the fight so next for Hall should be his rematch with Costa Phillipou, which personally I can't wait for. This fight was really close and could have went either way. Henderson finally got bit in the but with his tendency of close decisions. I personally had it for Benson, but it was close. Ben only has himself to be mad at. Up next for Cowboy should be Khabib, and the winner deserves the next shot after Dos Anjos fights Anthony Pettis. This fight panned out exactly how I expected. Siver was mentally broken before stepping in the cage due to the pro-Mcgregor crowd. Conor picked Siver apart and it was almost like Siver was scared. Up next for Conor: The showdown of the century: Aldo vs McGregor. More: More to prove for McGregor? 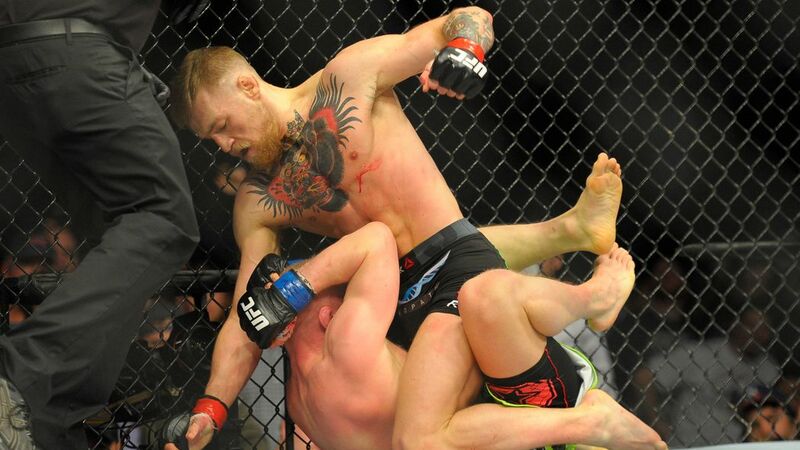 Conor McGregor pummels Denis Siver to make a statement and set his sights on the title in Boston.